What is SHIRV and how does it help my running. SHIRV is an antonym for Speed bounding, HIlls, Reps and Vest work. One of the major reasons for “slowing” as we age is a continuing loss of strength and flexibility. To slow down the rate of decline we must always work on maintaining strength levels. Whilst we can and should gain strength in the gym it is far more specific to work on core strength and running movements. We should always remember that running is a series of “one legged movements”. Speed bounding is an excellent example of a movement using one leg at a time whilst building strength and power. Speed bounding is just fast running with longer than “normal” strides. 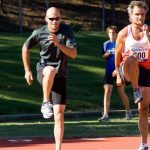 As we age, we tend to drastically reduce our stride length, although our stride rate shows only a minimal rate of decline up to age 55 with a slightly larger decline after that age. The reduction in strength shows up dramatically in the reduced ability to maintain our old stride length. Always remember that optimum stride length should not be achieved by over striding but by applying a greater force at take off. This greater force applied by more specific movement strength allows us to have less time in the support phase (i.e. 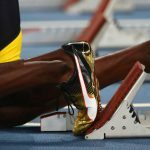 foot spends less time on the ground) and utilise more force off the ground thus giving us a larger stride length. Hills are excellent for specific strength and power. You don’t need to have a steep hill, in fact a slope from as little as 3 degrees is excellent. One doesn’t have to just run up hills we can hop, bound, double leg jump, all of which are useful. 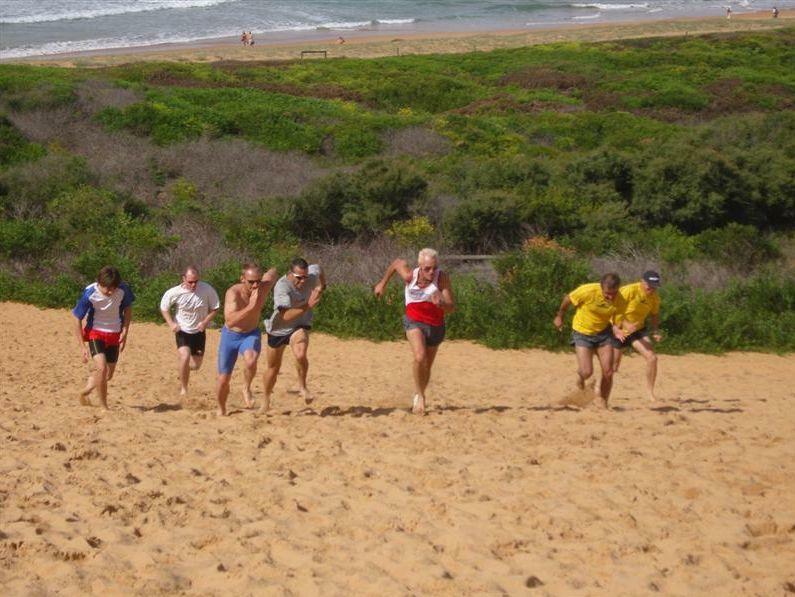 Other exercises similar to hills include tyre, sled, resistance pulleys or harness, stairs, parachute, stretch rubber fixed or held by another athlete. If an athlete wants to run faster. The athlete must run fast reps at training not just in the peaking phase but also all year round. There is no substitute for speed. Many athletes, particularly distance runners spend so much time building up their base there is little time left for speed work when it comes to that important meet, which often leads to sore or pulled muscles at the wrong time. Not only do we have to run fast, we have to run faster, in fact faster than race pace. If we are a sprinter we may use a towing device, rubber or pulleys, run downhill (only 3%) or run with the wind. In addition we will run under distance like 30’s, 40’s, and 60’s from a start or run in. Other runners will apply the same techniques but will also run longer reps e.g. a 400m runner may run 1’s and 2’s totalling 400m with short recoveries but faster than race pace. This can then be repeated after full recovery. The same principal applies to longer distance viz an 800m runner who may run 200’s, 300’s and 400’s,or a 5K runner who may run 400’s, 800’s and 1K’s etc. Vest work is not as easy to achieve because of the difficulty in obtaining a suitable weighted vest. However the results are outstanding with greater strength and power gained arising from the added resistance provided by the extra weight carried. Running with weights in your hands is a virtual waste of time and the only result is likely to be sore shoulders. Leg weights would be better, but a vest is the better alternative. Good alternatives to Vests, could also be Parachute or Resistance Belts. SHIRV training is quite specific in its application to running. If you apply it correctly you will be more stable in the torso area, have stronger Gluteus muscles and have developed more power. Arising from the above, it is also likely that you will be better able to apply yourself to the development of speed utilising greater force with the aid of more flexible hip mobility. In summary you should be stronger, better able to apply appropriate force on take off, spend less support time (i.e. the actual time the support leg spends on the ground) and have a relatively straight leg at toe-off. We all slow with age but the most important thing we can do is to slow down that process and SHIRV is very important to that end.